In the United States, the right of citizens to bear arms is stated directly in the second amendment of the constitution. While this amendment clearly sums up the legality of the matter, there exists many individuals and groups in the United States who believe there right to purchase guns and ammunition is in jeopardy. Rightfully so as debates about gun control have been coming up in the United States recently. With tragedies like the shootings at a movie theater in Aurora, Colorado and at Sandy Hook Elementary school in Newtown, Connecticut, both with multiple fatalities, these gun control activists do have some grounds for discussing tightening the hold guns in the U.S. Recently, a gun dealer in Maryland who had been planning on selling a gun with a new technology was allegedly issued threats if he sold the weapon out of his store. The technology in the gun prevents it from firing unless the owner wears an accompanying wristwatch. This technology is seen as a major threat to anti-gun control groups whom criticized the man who is an anti-gun control activist himself. Is gun control a violation of the 2nd Amendment? Is gun control a viable option in the United States? Do gun control Laws solve the problem? This article found on JSTOR is a quantitative statistical analysis on the effectiveness of gun control laws. Using multiple variables, it compares the number of gun related fatalities in states with restrictions on firearms in place to those without any state regulation. The study finds that gun control has little to no effect on gun related fatalities. ﻿This article found on JSTOR also uses quantitative statistical analysis to see if gun control legislation is the answer to reduction of gun related fatalities. 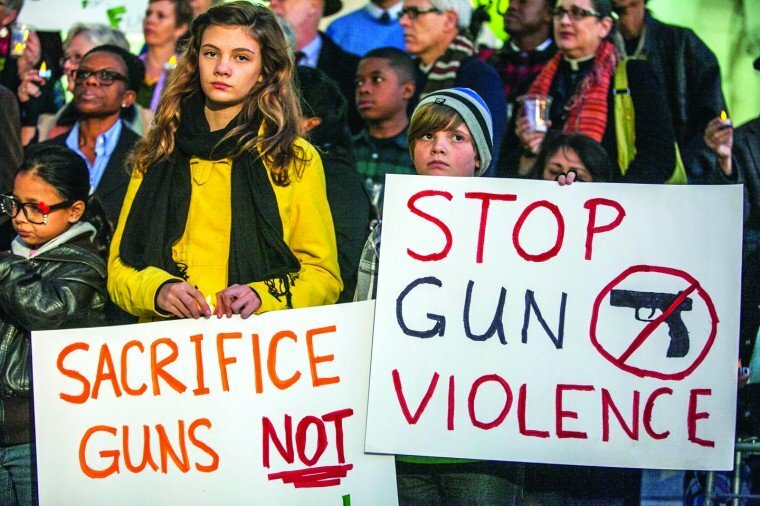 In this article it is found that gun control does in fact lower the number of gun related fatalities, however the study also concludes that gun control is not enough. Socioeconomic factors as well as effectiveness of law enforcement also have an effect on gun related fatalities. The study suggests a need for legislation which covers a broad range of issues must be implemented in order to significantly reduce this issue. Children holding up pro-gun control signs at a protest rally. This first link is to a fox news article which gives some information on the gun dealer mentioned above. This article also demonstrates the extreme nature of some anti-gun control activists in this heated controversy. The next link is to a non-profit, non-partisan affiliated news, blogging, and scholarly articles website. It also has multiple videos where the debate over gun control is discussed by experts. People in the United States are constantly exposed to media throughout daily life. Exposure to mass media happens even if you do not mean for it too. It is on magazine covers at supermarkets, posted to billboards along the streets, on television screens and cellular devices. A vast amount of this media, while marketing products, is creating and perpetuating pop culture. Whether you like it or not, you are going to encounter media to some extent daily. Is it a good thing to be so interconnected in the modern day that even this blog can be viewed by anyone around the world with access to the internet? How much of an effect does pop culture have in the United States? What does this instant communication do to cultural norms and fads in the United States? These are the questions I will explore and give insight to in this blog. This article found on JSTOR is about the Mass Media and how it has effected Culture in the United States. The article makes several interesting conjectures; one of the most interesting being that Mass Media's standardization of information which is then exposed to the average consumer inhibits the potential for creativity and art. to flourish. This is one article from a large collection of published works call the Daedalus. The next article was found on the American Sociological Review website. This Article discusses how social stratification in the United States has lead to the famous being considered as the elite. It discusses the true nature of mobility in the United States especially among the famous. Stating that once one has reached a certain tier of fame, the media and society both perpetuate that fame. On the release date of a new pair of Air Jordans made by Nike, multiple fights were reported at shoe stores around the country. The image on the left is of a fight happening outside of a footlocker where the sneakers were set to be released. The Sneakers on the right are Air Jordans. This link is to a video clip found on youtube.com shows interviews with people on the street as well as gives information on the major companies which are in control of mass media in the U.S. The most interesting finding is that there are so few companies controlling such a large portion of media in the United States. This website link will take you to a website established by NOW which is the National Organization for Women. It shows what companies are in control of popular television programming. It also gives a brief background on the company. ﻿This link will take you to an article from Phys.org which has data on just how often people are exposed to media daily. The numbers are astonishing already and are projected to rise.